TGIF! Tiger Challenge Countdown Begins! We are so proud of our Teach Tigers for taking on the Tiger Challenge! We look forward to the Tiger Tally tomorrow! This is last chance to count for kids who bring in $100+ to earn a popsicle next Wed! Bring in your pledge envelope with your collected donations. Remember, parents can include a direct donation and it will go towards your prize goal. Final collections are due Thu Oct 6. We are looking for volunteers for set-up, serving lunch, clean up, to provide fresh fruit, and to pick up the pizzas. We also need volunteers to help with games and materials for games! To help make our event a success, please sign up at www.signupgenius.com. Cheer on Students & Stay for Pizza Lunch! Family & friends are invited to come celebrate fun and sportmanship at the Teach Tiger Challenge on Friday, October 7th at noon! Pizza lunch will be provided free of charge for our hardworking students. Pizza lunch orders are for guests of students (parents, grandparents, neighbors) cheering on the students during the Tiger Challenge field events. Place your order online or return a Pizza Lunch Order Form to the office by Thursday, October 6th. Thank you, Tiger Challenge Sponsors! 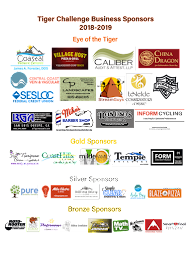 Thank you so much to local businesses, who are supporting Teach School and the Tiger Challenge for 2016-2017! Click on logos to learn more about the businesses! Teach Tigers Choose Challenge & Grow Grit! We are heartened to see so many students taking on the Tiger Challenge! As of Friday 9/16/16, we're at $32,083! Congratulations to all of our Tiger Challenge participants! Sixty-four students have brought in $100+ by last Friday and earned popsicles tomorrow Wednesday at lunch time. Note: Children, whose families have donated their Tiger Support of $100+ by last Friday, are also included! Look for Mrs. Daane on the blacktop with the bullhorn tomorrow during lunch! We'll be doing another Tiger Tally on Friday so there are more chances for cool, refreshing popsicles next time! Just bring in pledge envelope with donations collected! More info on Tiger Challenge and prizes here. Business Sponsorships - Due THIS Friday! Don't miss this fantastic opportunity to advertise year-round along Grand Ave, on t-shirts and/or via digital media! These spots -- just like street parking on high-traffic Grand Ave -- are going fast! The deadline for business sponsorships for Tiger Challenge is THIS Friday 9/23! Complete form or online! Email logo to Brad Daane. Tiger Challenge Donations, including any installments received by Oct 6 11:59pm PDT, count toward the Tiger Challenge contests! Donations are tax deductible to the full extent of the law. Please consult with your tax advisor regarding your specifics. 3 Month & 6 Month Installment Options Available! At the PayPal Store, we have added 3 month and 6 month installment options for $600 ($615 PayPal) donation amount at the top left menu bar! There is also the "Other Recurring" option on top menu bar, if you prefer a different monthly amount to donate. Does your employer match your contributions to not-for-profits like Teach Booster Club (Federal Tax ID# 77-0384261)? A partial list of companies that match can be found here or searchable here. Find out from your Human Resources/Benefits department! 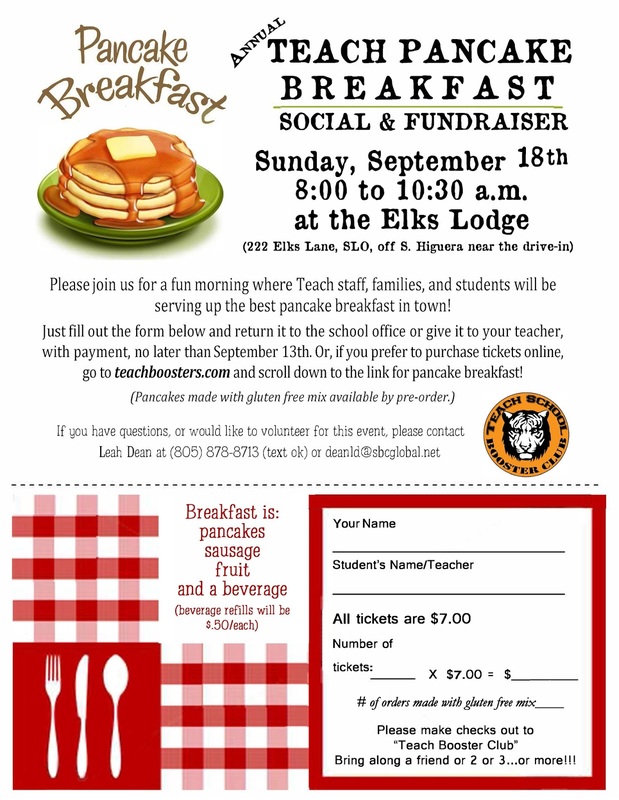 The Annual Teach Pancake Breakfast is THIS Sunday! The Pancake Breakfast at the Elks Lodge is a fun social event bright and early on Sunday morning 8-10:30am. 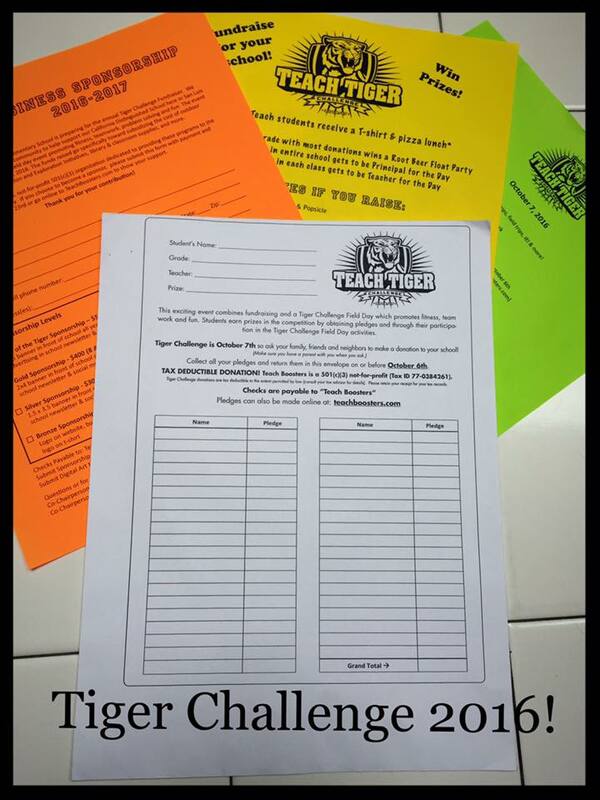 Complete the attached form with cash or checks payable to Teach Boosters and drop off at the Teach School office by tomorrow Wed or order online for 2.5% handling fee by Friday for your name to be listed at the door (no paper tickets needed for online orders). Thank you to so many of you who have already signed up to volunteer at the event! We have only a couple of spots left to fill! We are also asking for donations of strawberries for the breakfast. If you would like to donate or join in the fun by signing up to volunteer, this link will take you to the online form! If you have any questions, contact Leah Dean. By participating in raising funds, students own that they have a part in making the extraordinary experiences planned for this year come to fruition. Students can demonstrate their initiative, hone their persuasive cases (knocking door-to-door with parents, calling distant relatives) and expand their entrepreneurial skills by organizing bake sales or lemonade stand sales. Through this process, students appreciate the generosity of their family/friends/neighbors and cherish the opportunities of overnight study trips, Innovation & Exploration Projects and 6th grade play that much more. With that said, the Tiger Challenge is fun! Students will earn prizes for themselves and for their class based on the pledges collected by October 7th and the participation in the field day events on October 7th. Pledges can be made by cash or checks payable to "Teach Boosters" or online (with 2.5% handling). Students can also earn $15 for every business sponsor they bring in! Read more about this year's Tiger Challenge here. Thank you to Tiger Challenge Co-Chairs Amy Daane and Mukta Naran. * My husband and I had previously just wrote a check for our son for these types of "a-thon" fundraisers at other schools. 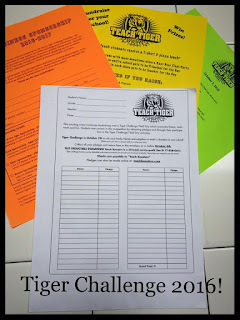 Last year was the first year that we encouraged our then 4th grader to engage in the Tiger Challenge fundraiser. He mustered up the courage to call grandparents and great aunts/uncles and truly appreciated their generosity and going to Camp Ocean Pines.